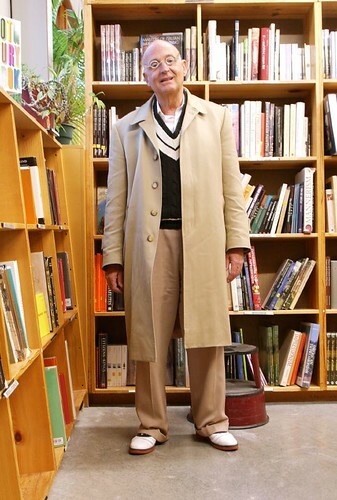 I noticed him flipping through art books in Powell's and had to have his photo. I was a bit nervous asking him, as I can never be sure how older folks will take my asking for their photo (it's been unpredictable, although I've found that the forty- to fifty-year-old crowd tends to be the most skeptical). But he was quite nice about it and was also very pleasant to chat with; he mentioned that he used to be a buyer for Bergdorf Goodman and loves fashion photography. I need to find people like him in Seattle! this guy rawks all those emo kids on Cap Hill! this man reminds me of taylor mead, although much differently adorned. It is nice to see more variety in ages and styles in your photographs lately. Keep it up! Love his look, and I'd love to see him without the jacket, too. oh, he's so classy - what a great find. about your approaches, it seems like that would be a interesting part of keeping up this blog, maybe you never get over that first "pardon me..." but it seems exciting. seems like it would make a lot of people's day! I adore his demeanor and the environment.